Food For Thought: Vegan, Fact Or Fiction? 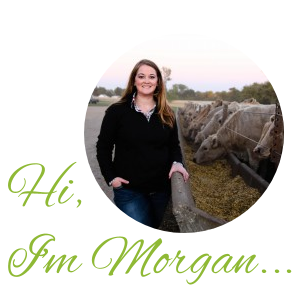 I was super excited this week because one of my readers asked me to do a post on vegans. They had recently watched an episode of Dr. Phil and low and behold he was discussing vegans. Ovo-Lacto Vegetarians: Do not eat meat, but will eat dairy products and eggs. I know what I believe when it comes to vegans, but I thought for this post it might be nice to see what is drawing people into the trap of no longer eating meat. So, first I visited the PETA website. You pull up this vegan/vegetarian portion of their website and you get to scroll through about 10 pages of why you should become a vegan. I did everything in these pages from take a quiz on getting to know your meat…to animal agriculture is the main reason for global warming. On our farm I would say our animals live a cruelty-free life every day. Like I have said numerous times before, agriculturalists care about the welfare of their animals. What exactly is a factory farm? 98% of farms in the United States today are FAMILY owned. It seems everytime I turn around the television is always highlighting becoming a “vegan”, mainly for the purpose of advocating against animal cruelty. There are so many products that come from animals, not just the meat. To sum it up take a look at this picture. There is a purpose for almost the entire cow. We call these “extra” products animals provide us with by-products. At the end of my 10 slides of information from PETA they ask you to pledge to go vegan for 30 days. Not for the reason you are thinking. I would like to explore the world of vegan more…mainly to be able to relate more to my own cause of continuing to eat meat. Vegans claim they feel better after starting a vegan diet. I don’t believe that it is from the lack of eating meat. I am sure that they probably do start to feel better, but only because they are more conscious of what they are putting into their bodies. However, I can’t quite lay claim to this unless I choose to try the vegan diet. Which, in turn would be really really difficult for a beef farmer. What if they use the manure of beef cattle intended for slaughter on the crops of the fruits and veggies for vegan products. Is it still considered vegan? Or, one better yet…What exactly defines a living thing? There is a great study from Michigan State University that claims that plants are technically living things. So are we not inducing a cruel environment for them when we grow them for human consumption? As I finish this post I now find myself reflecting more on the ‘vegan diet’ and I find myself leaning towards the fact that vegetarianism in itself does not exist. This is not my last post on vegans or vegetarians. This is just me skimming the surface with PETA. I hope to expand my research through out the week. 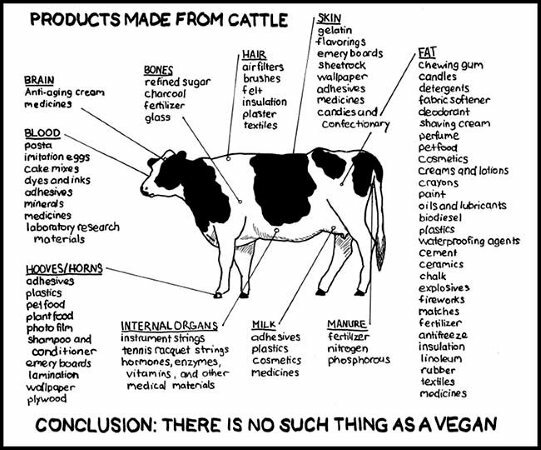 Yes, there is such a thing as “vegan”, raw vegan, informed vegan, etc…stop posting such garbage to justify your excuse to unnecessarily consume dead flesh and support the cruel, so called dairy industry. Wake up! Thank you for your comment- however, my posts aren’t me attempting to justify eating meats. It’s a choice I make just as the choice you make to not eat meat. One of the points I am trying to make with this post is that it must be nearly impossible to try being any type of vegetarian in this world today, simply because of animal by-products. I think that the decision to not eat meat is completely up to every individual. As for me, I will continue to eat meat. And I know that our meats are raised humanely and I also trust the USDA certified slaughtering process to ensure that animals are continued to be treated humanely until the very end. Btw, look in the eyes if a cow, or pig, or chicken, then look in the eyes of a carrot, they’ll me if you see a difference? !